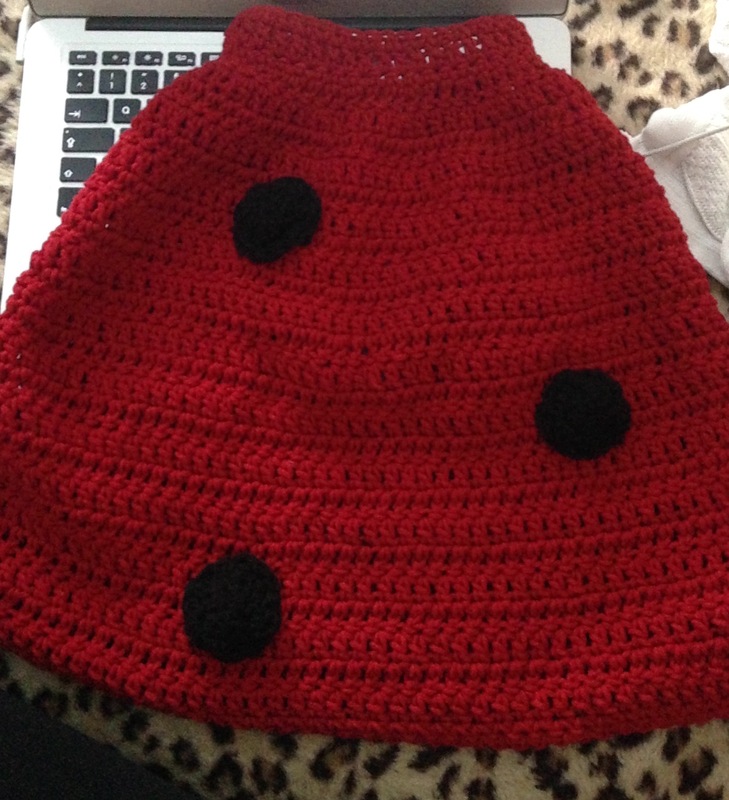 I asked our little one what she wanted to be in Fasching and she told me a ladybug. No idea where she had the idea from, but my brain starting searching for ideas right away. 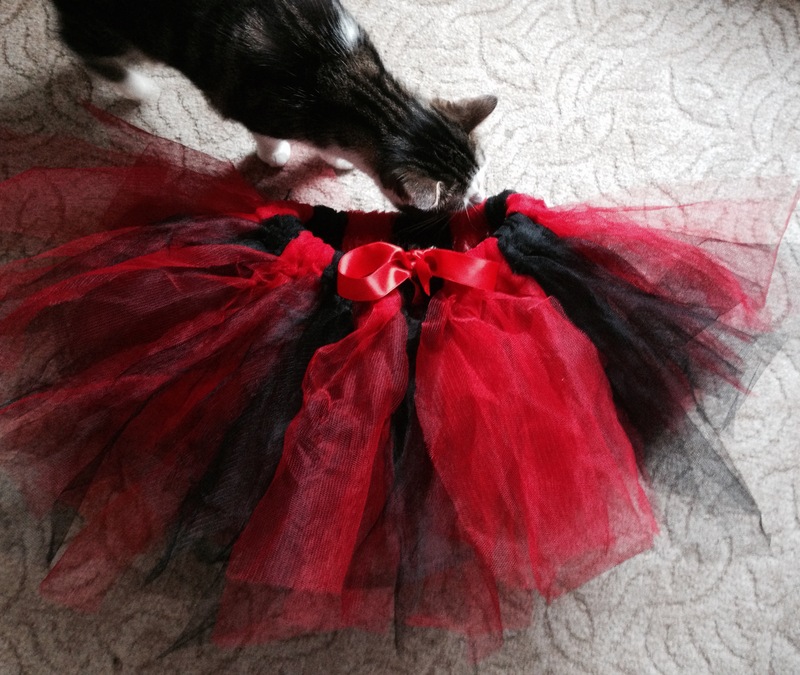 I came up with this red cape with black dots, as well as the black/red tutu with a red ribbon around it. Hope she likes it as much as I do. I will add the pattern soon. Row 1: Dc in 4th ch from hook, *2 dc in next ch, dc in each of next 2 ch; rep from * to end of row -49 dc. Row 2: Ch 3 (beg ch counts as first dc on this row and on all following rows), turn, *2 dc in next dc , dc in next 4 dc; rep from * to last 3 sts, 2 dc in next dc, dc in last 2 sts – 59 dc. Row 3: Ch 3, * 2 dc in next dc, dc in next 4 dc; rep from * to last 8 dc, dc in each st to end of row – 69. Row 4: Ch 3, turn, dc in each dc to end of row, turn. Row 5: Ch 3, turn, dc in next *2 dc in next dc, dc in next 12 dc; rep from * to last 3sts, dc in each dc to end of row. Row 6: Ch 3, turn, dc in each dc to end of row. Row 7: Ch 3, turn, *2 dc in next dc, dc in next 11 dc; rep from *to last 2 sts; dc in each dc to end of row – 81 dc. Row 8: Ch 3, turn, dc in each dc to end of row, turn. Row 9: Ch 3, turn, *2 dc in next dc, dc in next 12 dc; rep from * to last 2 sts dc in each dc to end of row – 87 dc. Row 10: Ch 1, turn, sc in first 22 dc, dc in next 43 dc, sc in last 22 dc. Row 11: Ch 3, turn, *2 dc in next st, dc in next 13 sts; rep from * to last 2 sts; dc in each st to end of row – 93 dc. Row 12: Ch 1, turn, sc in first 23 dc, dc in next 47 dc, sc in last 23 dc. Row 13: Ch 3, turn, dc in each st across. Repeat 2x. Row 14: Ch 1, turn, sc in first 23 dc, dc in next 47 dc, sc in last 23 dc. Repeat Row 13 again 3x. Row 15: Ch 1, sc in each st across. Fasten off. Row 1: With RS (Right site)facing, join yarn at right edge and working in opposite side of foundation ch, sc in same sp as join and in each ch across – 37 sc. Ch 1, turn, sc in each st across, turn to work down left front edge, sc evenly spaced down front edge to bottom of Cape, across lower edge to right front edge and up right front edge; join with slip st in first sc. Fasten off. 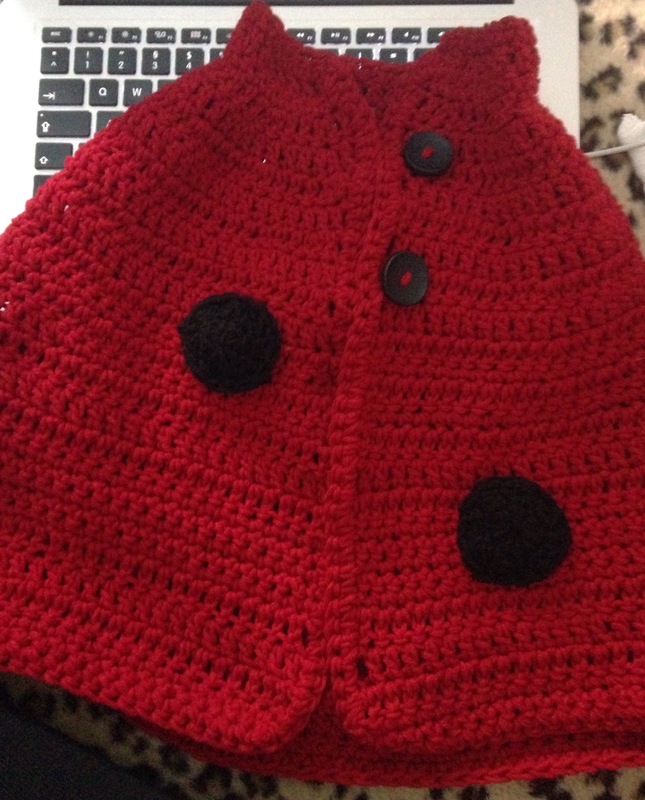 Made changes to it, since I used a thinner yarn.